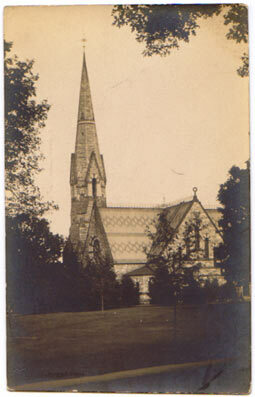 The College Church was erected in 1873, built with money donated by William F. Stearns, son of the President of the College at the time. Accompanying the donation were a number of conditions for its site and use in religious terms. A number of locations were considered, including the present location of the War Memorial. (King, 79). A real photo postcard of the church on the left, and a photograph of the steeple as it looked on October 12, 2001 on the right. William A. Potter of New York was picked to design the church, and it would be the first commission of what King called "a career which seems to have been undistinguished in professional accomplishment" (79). The cornerstone was laid September 22, 1870, and the building was completed in 1873. 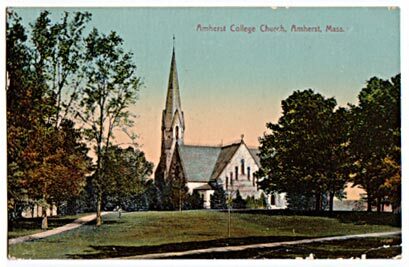 In 1870, a set of bells were placed in the steeple as a memorial to the Amherst men lost in the Civil War, and the bells and steeple are the only elements of the church that remain today. The church had a number of problems as far as facilities were concerned, and changes in attitudes towards religious services (as well as the general opinion that "only dynamite could improve it," as King quotes Milo Gates '86 as saying), led to the abandonment of the church for regular use in 1932 (King, 215-19). 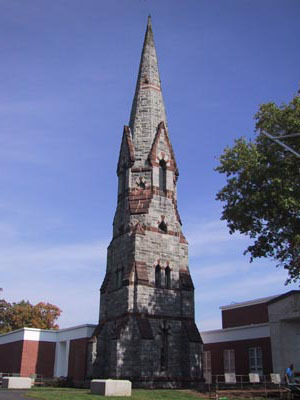 In 1948, after the site was determined to be the most suitable for a new arts building as well as an appropriate location for two new dormitories, the board approved the razing of the church (276-277), but voted to retain the steeple "for reasons of sentiment" (283).